We partnered with the Financial Times as a sponsor of the FT Digital Summit, providing us with a platform to showcase our expertise in digital healthcare advertising. As a full service creative agency, what makes us different from our competitors and what we can do for you is to – simplify complexity. By using our knowledge, understanding and creativity, to deliver innovative communication solutions for our clients, from branding and product launches to global campaigns. 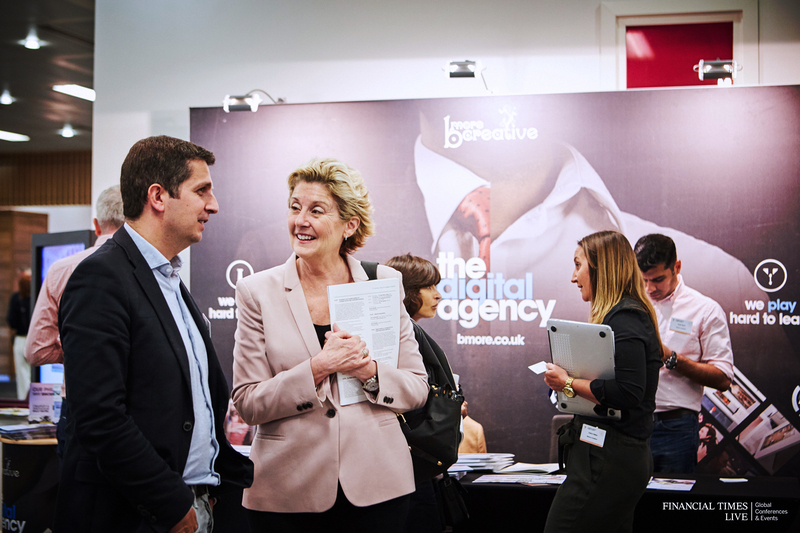 At the summit, we attended several key talks, one of particular interest was by Juliet Bauer – Director of Digital Experience for NHS England. It was about the launch of the NHS Choices app portal. Though positioned as a launch, this was actually a relaunch of the brand. The NHS Choices website receives 1.5 million hits a day, providing a great opportunity to add value for customers and increase engagement that could lead to revenue. The types of apps available in the NHS Choices portal are mainly health management apps. These apps reduce burdens on patients, HCPs and ultimately, the NHS. These apps help patients manage their condition, freeing up time and reducing days off work. Instead of the patient having to travel to hospital for an appointment, the apps allow them to manage their condition wherever they are. The apps allow for the patient to manage medication, follow educational videos on best practice for their condition, and send medical data to HCPs so it can be reviewed remotely. The apps also contain patient diaries to optimise treatment based on a record of symptoms. Some apps have been successful in reducing patient related errors by up to 98% just from watching educational videos. For HCPs, the apps enable more effective patient management as they can analyse the data for individual patients. This frees up time for HCPs to focus on patients with greater need, improving quality of care. Time saved also translates to cost savings – a clear benefit for the NHS. This then allows the NHS to allocate budgets to areas that need it most. Perhaps an innovative app could help you solve a difficult business challenge? Our expertise means we’re best placed to deliver apps and other solutions that simplify the complex for you. We can help you increase engagement with your customers, providing them with added value and you with greater return on your investment. For example, we created an award-winning multi-channel disease awareness campaign for Shire Pharmaceuticals with our Find Gaucher AR app including VR medical education. The difficulty in diagnosing Gaucher’s disease is that the disease manifests in multiple organ systems with a variety of symptoms. This delays diagnosis for patients, sometimes for decades, before they are diagnosed and on treatment. Delayed diagnosis is bad for business as missed patients are lost revenue. The app is an educational tool that helps the HCP learn the key symptoms and diagnostic criteria of Gaucher’s disease. The audience was varied and aimed at those HCPs who would be most likely to make a diagnosis; typically, secondary HCPs such as haematologists, bone specialists, and HCPs specialising in internal medicine. This campaign used channel maps to identify key target audiences, traditional and digital advertising, in line with Shire’s marketing needs. We also created the sales aids, eDetails, leave pieces, and other marketing materials in this multi-channel campaign that was a multi-award winner, winning the UK PM Society and IPA Best of Health awards. All of these solutions improved engagement and ultimately, sales, for Shire. For us to help you increase your engagement, reach, and sales, visit the bmore website! We can help you with ‘so much more’, including strategy, branding, advertising, campaigns, content, and digital solutions to push you and your brand ahead of the competition.